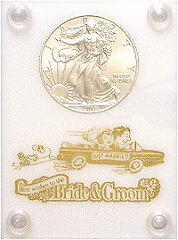 Custom holder for the American Silver Eagle. Three-piece acrylic holder with white insert. Every holder is individually handcrafted to assure a top quality gift. Nicaid holders - Gift package includes: acrylic holder w/gold stamped artwork, plush cloth pouch, gift box, display stand & current Uncirculated American Silver Eagle. Actual size is 2 3/4 in by 3 3/4 in by 1/2 in.